B. Mouse anti Bovine CD14 antibody, clone CAM36A (MCA6085) followed by Goat anti Mouse IgG1:PE secondary antibody (STAR132PE). 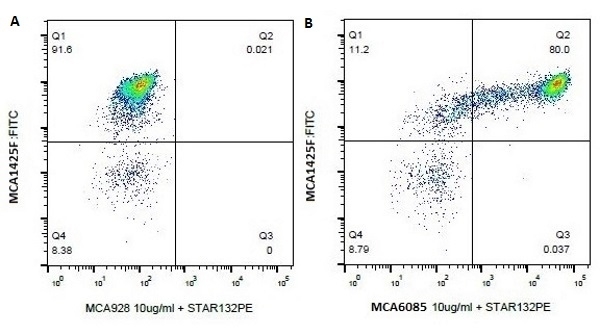 Both the Mouse IgG1 negative control and Mouse anti Bovine CD14 are plotted against bovine CD11b as recognized by FITC conjugated Mouse anti Bovine CD11b antibody, clone CC126 (MCA1425F). Mouse anti Bovine CD14, clone CAM36A, recognizes bovine CD14. CD14 is a co-receptor for bacterial lipopolysaccharide (LPS) and mediates the innate immune response. It is expressed at high levels on the surface of circulating monocytes, macrophages but also on bovine polymorphonuclear neutrophil leukocytes (PMN). Additionally, in cattle the soluble form of CD14 can be found present in the serum and milk (Sohn et al. 2004). CD14 signals through TLR4, MyD88, TIRAP and TRAF6 activating NFkB and eliciting the inflammatory response. Ahn J.S. et al. (2002) Scavenger receptor cysteine-rich domains 9 and 11 of WC1 are receptors for the WC1 counter receptor. J Leukoc Biol. 72 (2): 382-90. Zhang, Y. et al. (2001) Induction of interleukin-6 and interleukin-12 in bovine B lymphocytes, monocytes, and macrophages by a CpG oligodeoxynucleotide (ODN 2059) containing the GTCGTT motif. J Interferon Cytokine Res. 21 (10): 871-81.